"Cut The Rope" and "Pudding Monsters": 2 FREE "Superpowers" given for "Cut The Rope" and "Cut The Rope: Experiments"
2 FREE "Superpowers" given for "Cut The Rope" and "Cut The Rope: Experiments"
I think ZeptoLab wanted to celebrate Om Nom's 2nd Birthday (read: Om Nom turns 2 today, Happy Birthday !) by giving away 2 FREE "Superpowers" each for "Cut The Rope" and "Cut The Rope: Experiments". For my case, I have 2 iPhones and I received 2 free "superpowers" for "Cut The Rope" in my old iPhone 3G (which I didn't purchase any "superpowers" before) and 2 free "superpowers" for "Cut The Rope: Experiments" in my iPhone 4S (which I purchased 500 "superpowers" each for both games). Last time I only received 3 free "superpowers" for "Cut The Rope" in my old iPhone 3G. So I don't really know how ZeptoLab set the conditions for giving away the free stuff. There's a minor bug in the "message" (see above screenshot) which appeared before I got the free stuff. The message is gibberish for my case and I think they mixed up Simplified and Traditional Chinese settings. 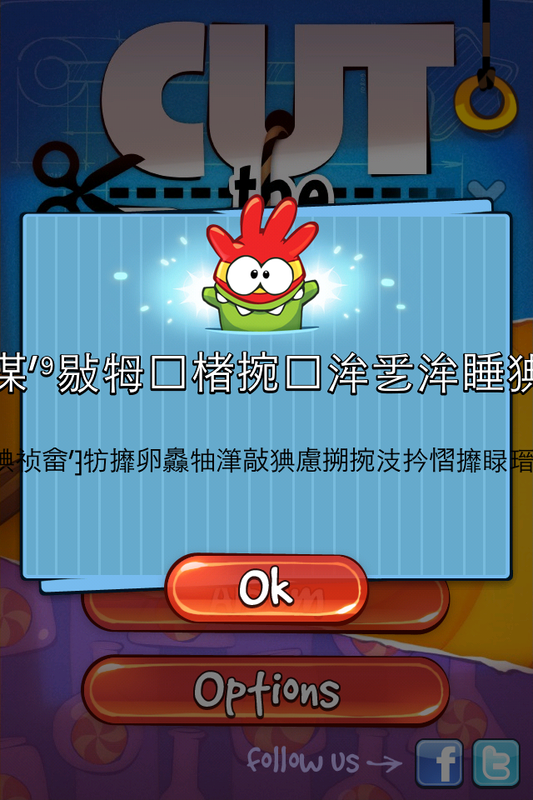 For the language settings inside both games for both my iPhones I chose English but I selected both English (the default) and Simplified Chinese for my SMS/MMS settings. Maybe those people who set their language settings to Traditional Chinese can view the message clearly but I'm not very sure about this. For my case they should have displayed the message in English since I selected English in the game settings. Anyway this is just a minor problem. If you don't know how to use the "superpowers", you can read my article: "Cut The Rope: Experiments" ver. 1.4 now has "Superpowers" !